Overview - Hit men Ray (Farrell) and Ken (Brendan Gleeson, Harry Potter) have been ordered to cool their heels in the storybook city of Bruges (it's in Belgium) after finishing a big job. But since hit men make the worst tourists, they soon find themselves in a life-and-death struggle of comic proportions against one very angry crime boss (Fiennes)! Setting is an important feature of any movie. In some stories the location that surrounds the characters can become a living, breathing entity of its own, just as important and integral to the narrative as the major players themselves. 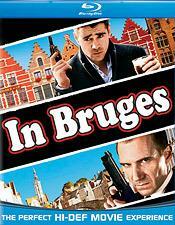 With the 2008 crime comedy 'In Bruges' that place of interest is the idyllic, beautiful, Belgian city of Bruges. A peaceful medieval tourist attraction littered with swans, rich culture, and apparently many alcoves, the dreamy, wistful streets of Bruges serve to lure the audience and characters into a kind of stasis, a hazy purgatory with a false sense of security, that is expertly juxtaposed against darker threats. As our characters pass through this fairy tale-like atmosphere, they bring with them pain, violence, guilt, and a healthy dose of humor, which all contrast perfectly with their charming surroundings in a hilarious and surprisingly thoughtful clash of bullets and wit. 'In Bruges' follows two hit men, Ray (Colin Ferrell) and Ken (Brendan Gleeson) as they are forced to lay low in the quiet city of Bruges after their last job fails to go according to plan. While Ken takes a liking to the serene atmosphere, Ray starts to go mad with boredom and wanders the town looking for action. When their boss, Harry (Ralph Fiennes), tasks Ken with a new and unsavory assignment, friendships are tested and complications arise. Martin McDonagh's Academy Award nominated script is wonderful and demonstrates a great command of tone. The opening line itself, which mentions Ray killing some people and then washing his hands in a Burger King bathroom, effectively sets the stage for the entire movie, showcasing a matter of fact treatment of violence that is undercut by a quick dose of humor. Full of sharp and biting dialogue, the characters are all given unique and distinct voices that still manage to carry a singular comedic wit and style throughout. The performances are also exceptional. Farrell's Ray is a charming mix of crass thug and sensitive soul. Almost every word out of his mouth is a potentially offensive, politically incorrect jab that is somehow written and delivered in just the right way, with just the right blend of innocent ignorance that carries no sign of mean-spirited intent. Gleeson is equally fantastic as Ken, bringing a kind intelligence and elegance that works well with the more unhinged traits of Ray. Even the more minor characters have their moments, and everyone seems to have an extra layer of depth hidden just beneath their exterior. Much of the comedy is a direct result of taking these potentially larger than life killers out of their usual seedy element and dropping them into such ordinary circumstances and surroundings. Some of the funniest bits come from simple little moments, reactions, or lines. Highlights include the gangsters' various attempts at simple sightseeing, Ray's surprising and childlike excitement at seeing a little person actor filming a movie in the city, Ken and Harry's discussion on the virtues of Pizza Hut, and one character's obsession with the many alcoves (or nooks and crannies) in Bruges. While the movie is consistently hilarious throughout, there is also a more serious element to the script that is handled with just the right amount of sensitivity and insight. An undercurrent of melancholy runs just below the surface of the film, flowing through the little nooks and crannies (or alcoves) of the movie's bittersweet score. Farrell's character harbors massive guilt for a mistake he made during his last kill, and this shame hangs heavy in Ray's heart and throughout the story itself. This sobering dose of reality plays well with the movie's humorous elements and adds up to a surprisingly thoughtful experience. While the movie is mostly successful, there are some minor areas of concern. A few actions taken in the last act bend the realm of believability just a bit, and though the characters are all well written, there is a certain inherent lack of authenticity that comes with having professional killers as kind, moral, and ethical as Ray, Ken, and even Harry. Also, though beautifully shot, the ending sequence might be a bit too ironic and thematically overt for its own good. Still, these are rather minor issues and the movie as a whole more than makes up for them. Overall, 'In Bruges' is a wonderfully entertaining, funny, and intelligent film about guilt, friendship, and atonement. The script is refreshingly creative and smart, with strong characters and dialogue. The city of Bruges itself comes alive through the dreamlike cinematography, and serves as more than just a setting, effectively becoming a major thematic element of the action. We may never know for sure if Ray escapes the peaceful limbo he finds so mundane, or if he finds himself stuck in a swan infested hell, but either way the journey through 'In Bruges' is well worth your time. Presented in a 1080p/VC-1 transfer in the 2.35:1 aspect ratio, 'In Bruges' looks quite good. The print is nice and clean, with some thin, natural grain present. The picture has nice levels of detail, but while not soft, it's never exactly razor sharp either. Many shots, especially those which feature the pretty lights of the city just out of focus in the background, carry a welcomed sense of depth, providing a sometimes impressive level of dimension. The film has an intended high contrast, almost dreamlike look to it, giving the idyllic town of Bruges a wistful and beautiful sheen. While this visual palette sometimes gives colors a slightly subdued look, they still carry a full and pleasing richness. Even with the slightly stylized look, black levels are deep and shadow detail is good. Overall, while not among the most impressive transfers the format has to offer, there is certainly nothing to complain about with the video here. Free of any technical artifacts or inconsistencies, Universal has done a respectful job. The film is provided with an English DTS-HD Master Audio 5.1 track and a French DTS 5.1 track with English SDH, French, and Spanish subtitles. Despite what the marketing for this film may have you believe, this is actually a fairly quiet movie, and the audio here reflects that. 'In Bruges' is mostly dialogue driven, and thankfully the speech is clean and crisp. The track is mostly front loaded, but surrounds are occasionally used early on for various atmospheric effects which add a nice but restrained level of immersion. When bullets do eventually start to fly, the surrounds rise to the challenge and bustle with activity. Dynamic range also proves to be fairly impressive in these action sequences, providing a nice booming contrast to the quieter scenes. Balance remains good between elements and bass also picks up with a nice, full punch. While not the most lively track, this dialogue centric film sounds very good with an effective but subtle use of surrounds. It won't exactly give your system an aural workout, but the track is technically strong and packs a powerful jolt or two when it needs to. Unfortunately, outside of the deleted scenes, supplements here are pretty sparse. Some behind the scenes featurettes or interviews with the filmmakers would have been welcomed. Supplements are all presented in standard definition with stereo sound and English, Spanish, and French subtitle options. Deleted and Extended Scenes (SD, 18 min) - Eleven deleted scenes and two extended scenes are presented here. Footage includes additional sequences of Ray and Ken visiting various tourist attractions, some additional insight into Ken and Harry's past including an actual flashback to an event mentioned in the movie that features the Doctor himself, Matt Smith, as a younger Harry. These scenes are all very good and seem to have been cut for pacing reasons. Definitely worth a look. Gag Reel (SD, 6 min) - A gag reel featuring some blown lines and outtakes from the movie. Farrell and Gleeson look like they had a good time, but this is pretty standard fare. Still, it might offer a laugh or two for fans. A Boat Trip Around Bruges (SD, 6 min) - This is exactly what it sounds like, a literal boat trip through the city of Bruges set to music from the film while facts about the town scroll across the top and bottom of the screen. Though a fairly odd supplement, there is a strangely hypnotic quality to the peaceful boat ride and you never know when facts about a beautiful medieval town in Belgium might come in handy. 'In Bruges' is an incredibly funny and dramatically potent crime film. Its rich characters, quotable dialogue, and bittersweet themes will stick with you for days, and while there are some tiny shortcomings in the final act, these faults are easily forgivable. The video and audio are both strong, but there's a lack of substantial extras. Still, the movie itself is the real attraction, so this disc is definitely recommended.